Each time a spider draws silk from its spin­neret to create a new web, it also draws on more than 400 mil­lion years of evo­lu­tion. Spi­ders have evolved to pro­duce a library of silks, each using a dif­ferent com­bi­na­tion of amino acids to address a par­tic­ular func­tional need. Some silks are sticky, making them per­fect for catching prey. Others are soft and duc­tile, good for mothers to use in cre­ating nests for their off­spring. Most are pro­por­tion­ally stronger than steel and even tougher than Kevlar. "There has to be some­thing about the mate­rial com­po­si­tion of silk that ide­ally suits it to make web-​​like struc­tures," said Steve Cran­ford, a newly appointed assis­tant pro­fessor of civil and envi­ron­mental engi­neering. As a grad­uate stu­dent at MIT, Cran­ford studied spider silks and other bio­ma­te­rials under the tute­lage of Markus Buehler. "We didn't want to just figure out how spider silk works, what we wanted to do was learn from spider silk and apply it else­where," said Cranford. By better under­standing the way nature uses mate­rials to build robust struc­tures, Cran­ford and his col­leagues hope to create their own stronger syn­thetic mate­rials and struc­tures. Cran­ford, who has a back­ground in struc­tural engi­neering, noted that this is a com­pletely dif­ferent approach from tra­di­tional struc­tural engi­neering, in which mate­rials such as con­crete and steel are chosen based on our expe­ri­ence with them, not their suit­ability for the system. The fruits of their labor have cul­mi­nated in the estab­lish­ment of an entirely new field of research, which Cran­ford, Buehler, and col­leagues from the Uni­ver­sity of Twente in the Nether­lands have dubbed "mate­ri­omics." Just as genomics refers to the entire genome as a col­lec­tive whole greater than the sum of its parts, mate­ri­omics con­siders all the parts in a struc­ture as a single entity with emer­gent properties. For instance, bone is typ­i­cally con­sid­ered a com­posite mate­rial, a com­bi­na­tion of both min­eral and pro­tein, but if you sep­a­rate the two, it's no longer bone, Cran­ford explained. Steel, con­crete, and a rein­forced beam are all exam­ples of other com­posite mate­rials, each con­tributing to a greater struc­tural whole. "So couldn't you just con­sider an entire building as a mate­rial?" Cran­ford asked. "What do you con­sider the mate­rial and what do you con­sider the struc­ture? You can't sep­a­rate the two." Ear­lier in his career Cran­ford studied seismic design and building failure. But seeking to make an impact in the bio­log­ical sci­ences, he ulti­mately came to view mol­e­cules as tiny struc­tures, sus­cep­tible to the same forces that impact build­ings and bridges. "At a small enough scale, atoms and bonds are just little struc­tures," he said, "From the right per­spec­tive, every­thing starts to look like a beam." Pro­teins like spider silk have inspired bio­mimetic research pro­grams seeking to develop every­thing from a better heart stent to a lighter bul­let­proof vest. But the dif­fer­ence between nat­ural mol­e­cules and syn­thetic struc­tures is that the former are the result of eons of evo­lu­tionary fine-​​tuning. 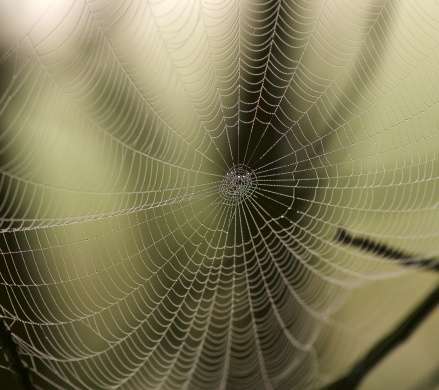 Bil­lions of trial and error exper­i­ments ensure that the spe­cific sequence of amino acids in struc­tural web silk is ide­ally suited for its pur­pose. The key for engi­neers lies in under­standing how the mate­rial can con­tribute and enhance per­for­mance, rather than in choosing mate­rials that meet arbi­trary struc­tural requirements. When designing syn­thetic mate­rials for use in bio­log­ical set­tings, say Cran­ford and his col­leagues, researchers should con­sider struc­ture and func­tion as two sides of the same coin. Steve Cran­ford, an assis­tant pro­fessor of civil and envi­ron­mental engi­neering, studies spider silk and other nat­ural mate­rials for insight into designing more robust syn­thetic structures. Are we justified in our fights to save endangered species?